This is the most romantic spot in Himalayas as vast meadows are spread in several hectares, a steep ridge stepping into horizon and lush green landscape flanked by the mighty Trishul Mountain (7120 meters). The three peaks resembling a Trident cant be as clearly visible as it's just 5 km away from here. We can see the intricate details of every snow field and cornice of the mighty peak, one of the highest in Uttarakhand. During Sunset the mountain turns gold and offer a breath-taking view. Bedni Bugyal is also a major route for Nanda Raj Yatra, held every 12 years carried by much fan fare. 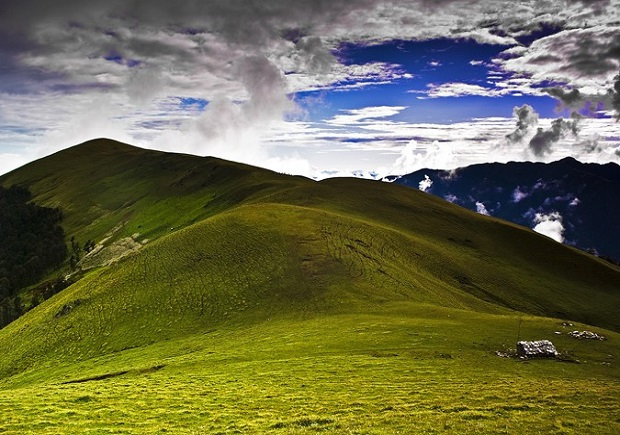 The twin bugyals are the finest high altitude grasslands in the Garhwal Mountains situated at (3350 meters) and famous for its wild flowers and herbs. 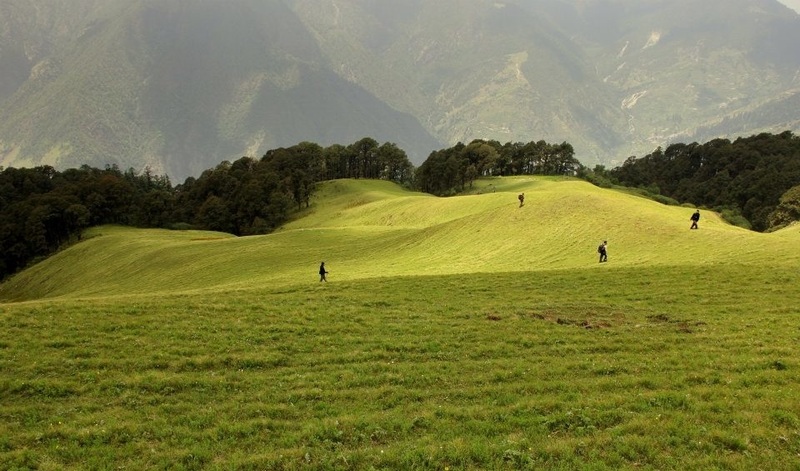 These are the largest high altitude meadows in Uttarakhand. The Bugyals also serve as a halt for the famed Roop Kund Trek. 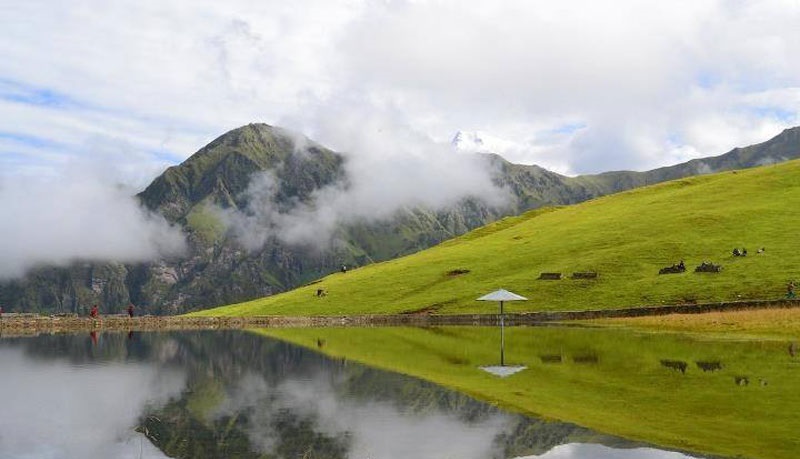 The Bedni Kund is also located in this region and is famous for the rare Brahma Kamal flower. Ali Bugyal is a day's walk from Bedni and the path also leads to a trekkable route from Kuari Pass and regions of Auli, an important ski destination of Uttarakhand. We can take a train to from Delhi-Kathgodam, which is a part of Haldwani-Kathgodam Twin City, a part of Nainital District of Uttarakhand. Situated at the banks of river Gaula, Kathgodam is one of the most picturesque locations situated in the foothills of Kumaon. From Kathgodam our cabs will drive you towards Lohajung and from there a jeepable road to Wan. It takes around 10-12 hours from Kathgodam-Wan as we drive through the Kumaon region alongside valleys of Shivalik Hills. We will cross Almora and Kausani which are popular tourist destinations in Uttarakhand. The last leg of the journey involves considerable height gain. Wan serves as a base camp for the trek. Overnight stay at a rest house. Half an hour from Wan there is a spur on a ridge above Wan, we will climb the bald ridge and begin our downward descend on the east of the hill. Another half an hour trail will lead us to a narrow valley with a river flowing nearby. Take some rest here as the next part of the journey is going to be taxing. The trail leads us through thick oak and rhododendron forests. Another 4 hours trail from here will take us to Bedni Bugyal. Once we reach Bedni Bugyal we will forget all tiredness as we will soak into the mesmerising sights of the unending meadows. Their are vast lush green meadows spread across everywhere our sight goes in all directions. Clouds are drifting over the landscape in slow motion and countless horses as grazing on the limitless grass. Take of your shoes, and let your feet relax on mother's nature carpet. The peaks of Trishul and Nanda Ghunti provides an awesome back drop to the most romantic place in Garhwal. Their is an ancient temple and few basic shelters nearby. Camp here in this beautiful location and have a divine experience as we prepare delicious meals and organise campfire for you. From Bedni to Ali there is an easy 5 kilometer hike. We wil have a leisure walk towards Ali Bugyal, spend some time there and come back to Bedni before sunset. Another day of camping at Bedni Bugyals. Today we will retrace our steps back to Wan, where our jeeps will be waiting to transport you back to Haridwar/Rishikesh. We will provide trained Hindi and English speaking guide and proper backup and safety along with great food and camping. Please inquire and fill ... Read More..